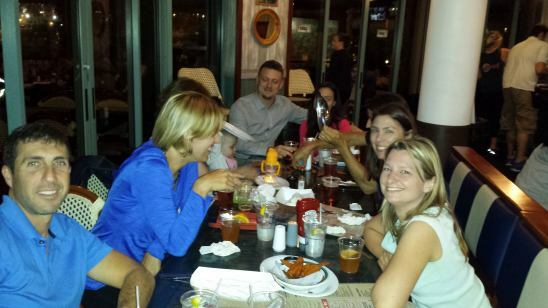 January 18, 2014 - A Peace Corps Partnership Dinner was held at Guanabanas restaurant in Jupiter. $445 was raised and was directed to the Local Garden project in Botswana. January 25, 2014 - The 2014 RPCVSF Everglades Outing was the largest ever with 140 children and 150+ adults, including 80 RPCVs. See photos on our "Photo Album" page. March 10, 2014 - Miami Heat game (42 RPCVs attended). We cheered as the Heat beat the Washington Wizards. Our name was on the screen at half-time and we were invited to watch the players warm up pre-game and were on the court to shoot a free-throw after the game. Thanks to RPCVs Alex Diaz and Natalie Farrior Castro for organizing the event! April 19, 2014 - Partnership Dinner at Bijon African Restaurant, North Miami. 26 RPCVs, family and friends enjoyed a delicious buffet of Nigerian and West African dishes and selected a dairy cooperative project in Nepal for a partnership donation of $561. Special thanks to Moji, the owner of Bijon, for the great food and hospitality. February 12, 2014 - PC staffer Meleia Egger joined us for a Happy Hour to talk about Third Goal activities and support from PC. And we toured the classrooms of the educators who won our Spirit of Service-Learning Award. March 22, 2014 - engaging "civil discourse" and lakeside barbecue at the home of Carlos McKeon and Sharon Wright. 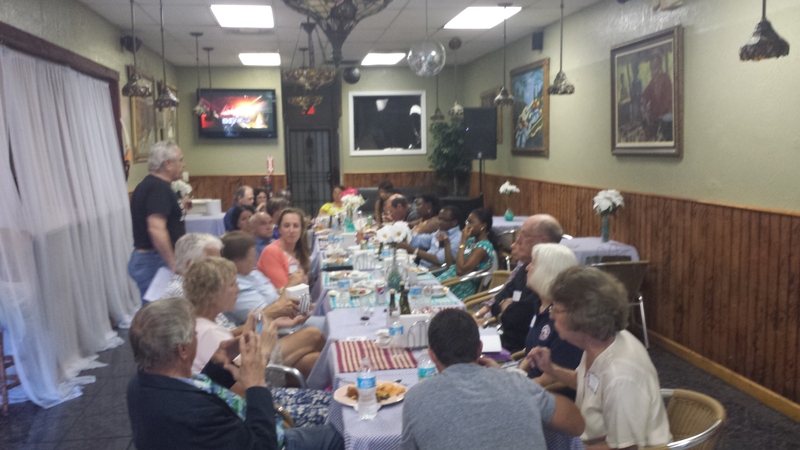 April 5, 2014 - potluck at the home of Alissa Fiss, Tamarac. 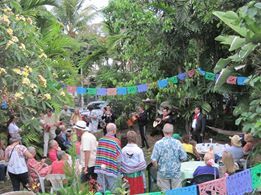 May 3, 2014 - Annual Cinco de Mayo Potluck at Helene Dudley's home. 40+ RPCVs enjoyed the Mexican-themed event with mariachis and piñatas, plus great food, drink and company! February 25, 2014 - Peace Corps Week, with the PC Director in town! See special page of this section for more info. 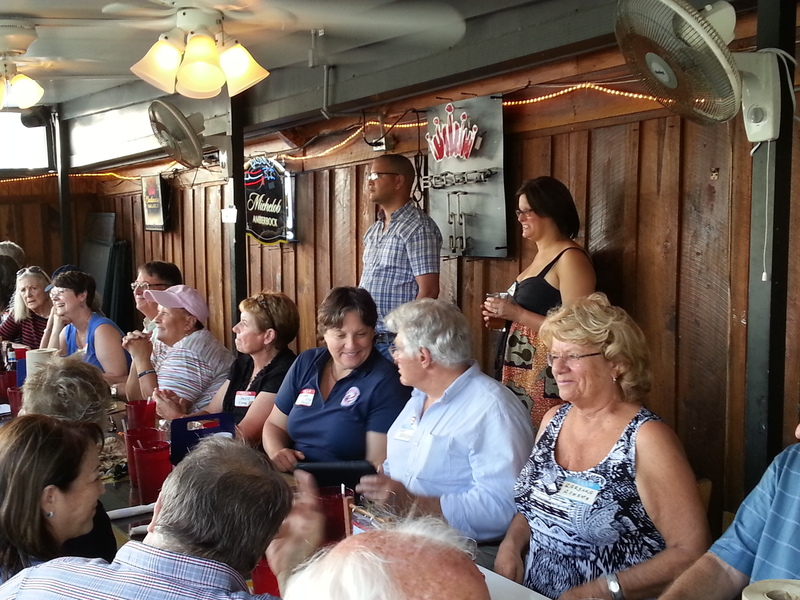 April 12, 2014 - Great turnout of 40 RPCVs, family and friends from both the South Florida and the Gulf Coast RPCV groups for a Happy Hour / Dinner at the Fish House in Bonita Springs. We hope it will be just the first of many co-hosted events. Thanks to Irene Brammertz for coordinating. May 18, 2014 - Bon Voyage picnic! More than 80 RPCVs, Peace Corps Volunteer nominees/applicants and their families enjoyed a great picnic and fun day at Oleta River State Park.